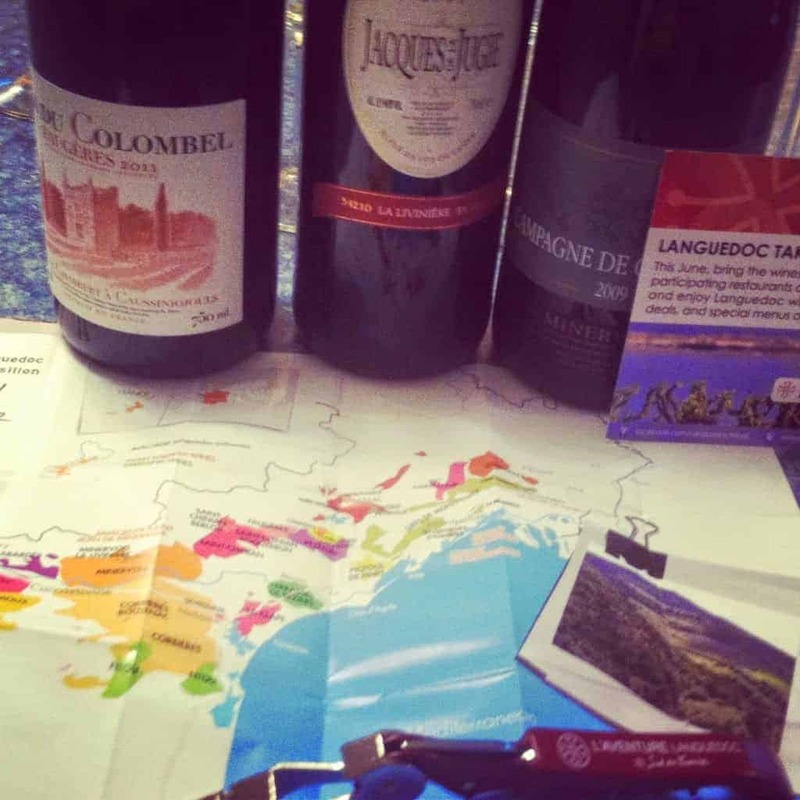 Would I be interested in hosting a tasting event as part of #LanguedocDay 2014 on May 30? I had tried enough wines from the Languedoc region to appreciate that this is a source of great wine values. The opportunity to learn more about the region and sample more of its wine sounded like a great time to me! So this past Friday evening we gathered with ten friends to sample a lineup of six wines from the Languedoc with the region, paired with some food that I thought would enhance the tasting experience. Oh yes, and there were a couple bottles of wine from other parts of France brought by guests, but we’ll save talk of those for another time! One sign of the Languedoc region’s consistent quality is that there was no clear consensus favorite wine from the evening, nor was there one wine that didn’t have at least one champion among our group of ten tasters. As we sampled the different wines, we had a map of the Languedoc region, and the 30+ AOCs (Appellation d’Origine Contrôlée) found there. You can reference the map we were looking at, available here as a pdf file. Now, on to the recap of the wines we enjoyed and the food we paired with them. Whites: We got the evening going with two Picpoul de Pinets. This was a good place to start, as Picpoul is a grape varietal native to the region that I’ve come to enjoy. First, the 2012 Saint-Peyre Picpoul-de-Pinet was poured. I taste a bit of lemon on this, with a hint of salinity–perhaps coming from Picpoul-de-Pinets proximity to the sea? This medium bodied wine has nice round mouthfeel. The Saint-Peyre was followed by the 2012 Domaine Felines Jourdan Picpoul-de-Pinet. I get a bit more acidity on this one. I prefer style of the Saint-Peyre, but the Domaine Felines Jourdan was definitely enjoyable and food friendly. I do have a bias toward the Saint-Peyre, as I get it frequently–at around $10 a bottle it makes a great everyday wine, and many of the guests were asking where they can find it. I get this at Pairings in Winchester, MA, where this wine is typically in a bin right near the door due to its popularity. I should note several guests indicated they preferred the second Picpoul. What to pair with these white wines from the Languedoc? Seafood is the classic choice. With this in mind, my friend John prepared some tasty baby scallops that went great with the Picpouls. 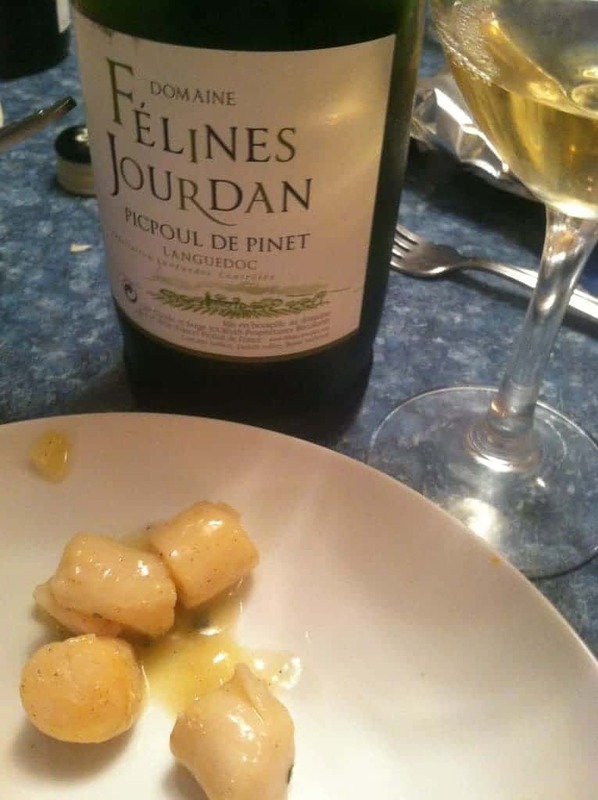 Jen from Vino Travels tweeted that Domaine Felines Jourdan Picpoul was “Drier in style w/mouthwatering acidity. 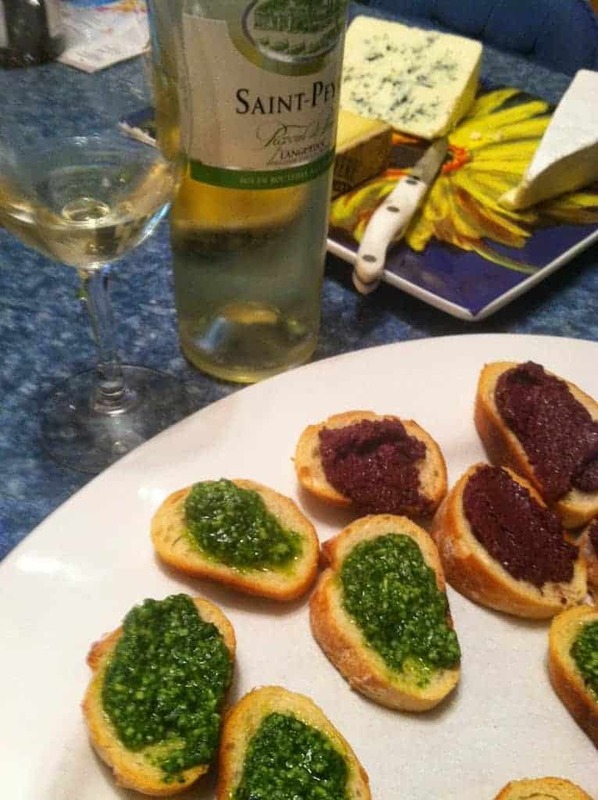 Great with scallops.” I’ve also come to really enjoy Picpoul with pesto, so I made some of my pesto crostini to enjoy with the whites. While I was at the crostini making process, I also topped some with some store-bought olive tapenade. Jen also brought some great cheeses, including a brie that went nicely with the Picpouls. 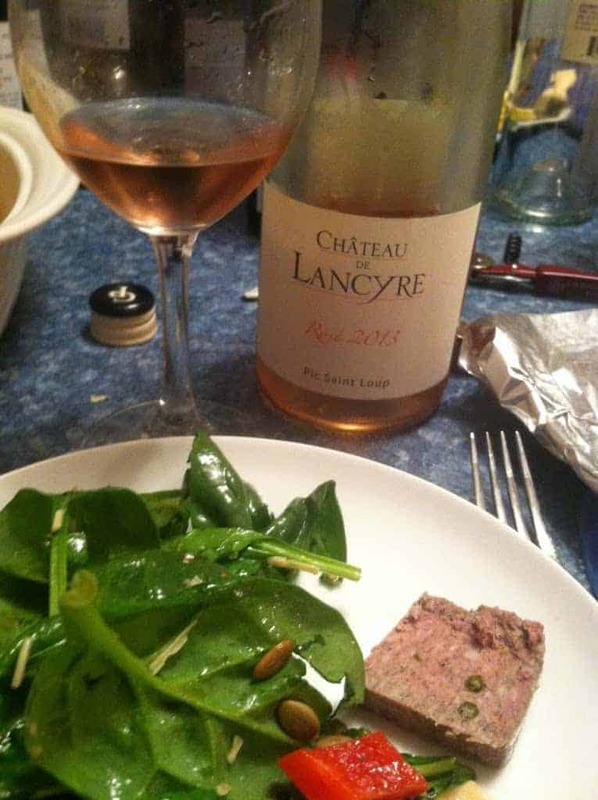 Rosé: We followed the Picpouls with a sampling of the 2013 Chateau de Lancyre Rosé from Pic Saint-Loup. The wine is a blend of 50% Syrah, 40% Grenache and 10% Cinsault. Everyone had good things to say about this rosé, Jen captured it nicely in this tweet. The salad referenced was made with spinach, tossed with parm cheese, toasted pumpkin seeds, and a vinaigrette following this simple method. For good measure I added a bit of the extra pesto, which everyone seemed to like! We also had some tasty green peppercorn pate from Pairings with the rosé, and continued to nibble on that and our cheeses with the reds as well. Reds: We started with the 2011 Jacques de la Jugie Minervois, a blend of Syrah, Grenache, and Carignan. This is one of two that we had from the Minervois AOC. This was the one in the lineup I didn’t care for much. I was busy finishing up the food to go with the reds when I tried it so didn’t get detailed notes on it. One person thought it could have improved with decanting or a bit more aging. Yet again, the diversity of the wines also yielded a variety of opinions, with one person liking this one best of the reds. 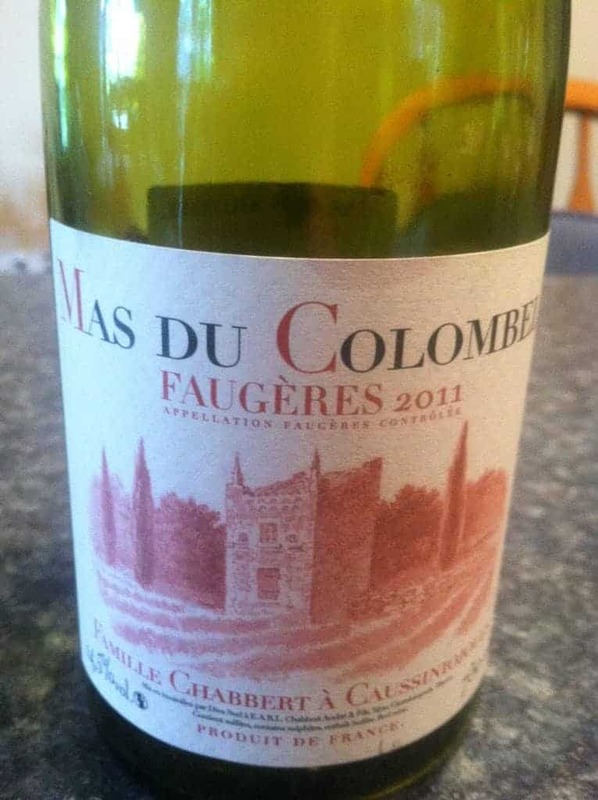 I really enjoyed the next red, 2011 Mas du Colombel Faugeres, a blend of Grenache and Syrah from the Faugeres AOC. Nice jammy fruit, soft mouthfeel and polished finish. This was probably my favorite red, especially to drink on its own, but the next pairing rivaled how well the Picpoul went with the scallops and pesto. The final red of the night was the 2009 Campagne De Centeilles, a 100% Cinsault from Minervois. I don’t know about you, but I don’t have too many 100% Cinsaults! Perhaps more than any others we had, this one seemed to have that garrigue thing going on–its aroma and taste had the fragrance of wild herbs like rosemary and lavender. 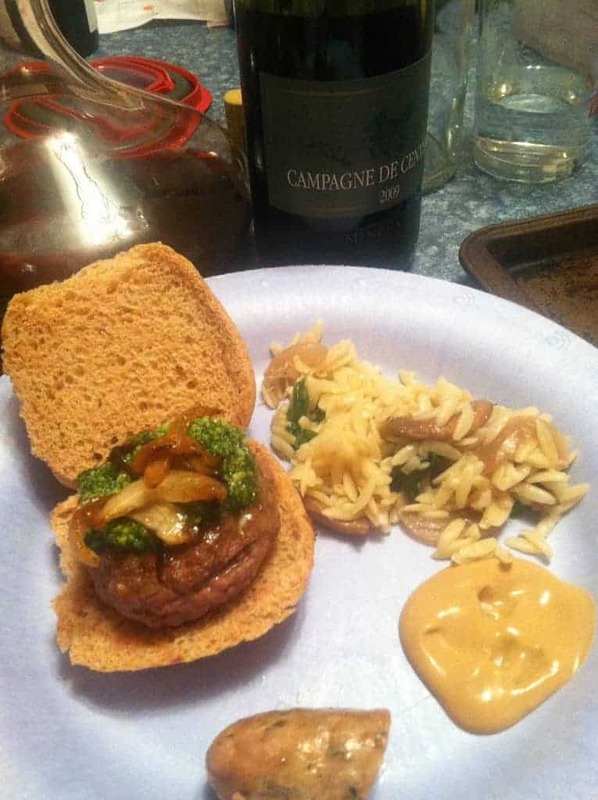 This wine was a great match for the lamb sliders topped with Provencal mint pesto I made! We also had some pork sausages with the reds, a common pairing in the Languedoc. If I’ve piqued your curiosity to learn more about the Languedoc region, you can get more information from the Languedoc Adventure website. 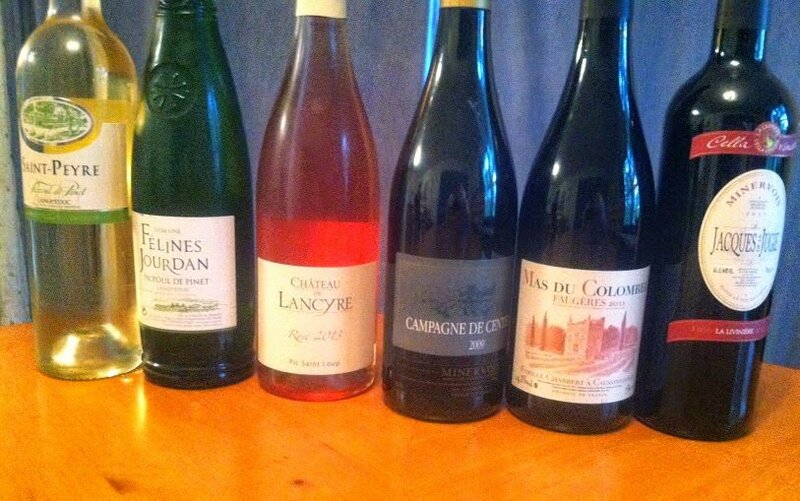 Full disclosure: I received these wines as free tasting samples from the #LanguedocDay event organizers.